A tailor-made train and self-drive adventure through European capitals and Hungarian countryside. Having missed the opportunity to backpack around Europe, this client was looking to experience the joy of travelling from country to country, but wanted everything organised in advance. She didn’t mind whether they travelled by car or by train as long as the journey was overland. 3 and 4* hotels in central locations within the cities were preferable, and they enjoy cycling in their spare time so some time to appreciate the countryside away from the cities would also provide an interesting contrast. This itinerary offers a fantastic mix of capital cities along with time to escape to the countryside in Hungary. By selecting an area of Europe well-connected by rail we were able to include some diverse capitals by train travel as well as the freedom to experience the countryside of Hungary at their own pace by car. Two full days available to explore the Gothic and baroque delights of Prague. Visit Castle District on the west side of the river where you can see an abundance of churches, palaces and galleries as well as the 9th century castle itself. 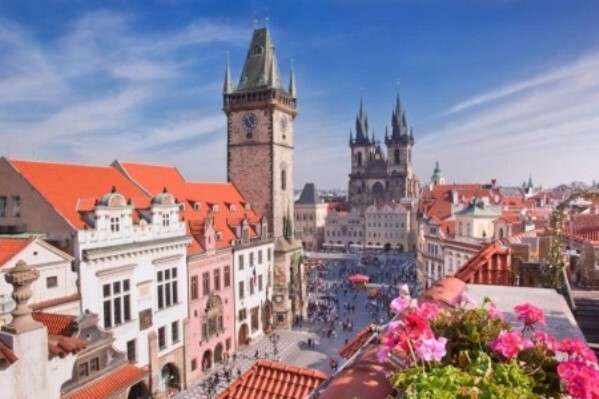 Across Charles Bridge you’ll see a very different side to the city; the Jewish Quarter and Old Town Square offer an abundance of cultural and historical highlights. In the evenings Prague has plenty to offer; a dressed up evening of opera or ballet at the National Theatre, or perhaps some live jazz at Reduta Jazz Club. Explore the Habsburg city of Vienna at leisure or perhaps book a bike tour as an alternative way to see the sights. Stroll through the wonderful baroque gardens of Schönbrunn Palace, delight in the treasures of the grand Museum Quarter, admire Gothic St. Stephen’s Cathedral or watch graceful stallions perform to a programme of classical music at the world famous Spanish Riding School (this one has to be booked well in advance!). Café culture and people watching opportunities aplenty. The Danube River winds through the city and cycle paths weave their way through the flood plains just outside the centre. The pretty forested hills to the North of the city see few foreign visitors and offer hiking and biking trails. The charming old town is well worth a visit. Stroll narrow pedestrian streets of colorful 18th-century buildings or sample the various sidewalk cafe’s beneath the backdrop of the city castle. Looking for a show to catch? The Slovak National Theatre shows quality operas, ballets and dramas. Budapest is a beautiful city and with so much to explore we’ve allowed 3 nights to truly soak up the atmosphere. For starters there are an abundance of bathhouses – take your pick from the Turkish era, Art Nouveau, or the more modern facilities. It’s the best cure for a hangover – or what the Hungarians call, a macskajaj, which translates as “cat’s wail”! Among the city highlights are Heroes’ Square, Vajdahunyad Castle, the Opera House, Fisherman’s Bastion, Matthias Church and the Citadel. But aside from this, Budapest is a romantic city perfect for a gentle stroll, a river cruise or to sample the underrated Hungarian cuisine and great local wines; try one of Villány’s big-bodied reds! Drive to Balaton National Park, home to the largest freshwater lake in Europe. Explore the stunning countryside on foot, by cycle, by boat or horseback or just drive through the many villages surrounding the lake. Close by is the well-known spa treatment centre, Heviz, known for its healing medicinal waters. Drive to the area of Szekzard in the southern part of Hungary and stay at the Baroque Castle Hotel Grof Apponyi in Hogyesz, set deep in 5.5 hectares of parkland. Enjoy the many spa and wellness amenities here in this wonderful setting. On your way back to Budapest be sure to take a side-trip to Eger and it’s famous wineries.